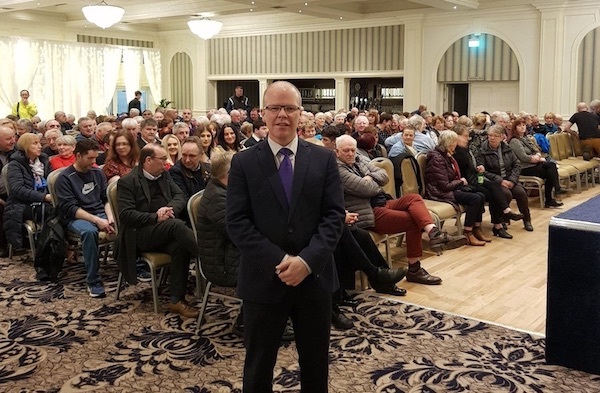 A new republican and pro-life political party being set up by former Sinn Fein politician Peadar Toibin is set to become a significant force in Irish politics after founding over 20 cumainn [branches] across Ireland, including six in the north. A hectic schedule of 32 public meetings across the state has already earned the new organisation 1,500 members after only 12 meetings. It is drawing supporters who have previously been involved in other political organisations, and many others who have never been politically active before. The still unnamed party is aiming to have a total of 100 cumainn set up by the end of February, drawing increasing concern from rival political parties who have urged their membership not to attend. In a letter to supporters, he noted the contining failure of Fianna Fail to organised in the Six Counties. He also says that selection conventions for the local elections will start in areas where there are elected representatives before the end of January. At the conclusion of the letter, Mr Toibin says that there is a need for the new party. After 21 years, Mr Toibin resigned from Sinn Fein last November over party ‘group-think’ after Sinn Fein adopted a hardline pro-choice stance. At its annual conference, delegates voted in favour of a leadership motion that banned party representatives from voting according to their conscience on the issue. The outcome was predictable -- the departure of a large number of senior party members, the latest in a series of painful splits for Sinn Fein in recent decades. Many of his old colleagues are still not talking to him, Mr Toibin said. “I have a lot of regard for many elected representatives north and south. There is a number of them in there that feel the same way I do around these topics, some may come with us, some may not. I wish them luck in their work. “Some individuals have been warm and friendly, and that is wonderful, there are some individuals who are hurt, in a big way, who are angry and who are not talking to me at all, and that is understandable too. This is the way these things happen. I felt I had no option but to leave the party. “I dearly wanted to see if we could make the changes on this issue [abortion] and also other issues within the organisation. Nobody can say I didn’t try my damnedest but unfortunately I felt I was left with no option but to leave,” said Mr Toibin. He also said he had received a lot of phone calls from members of Fianna Fail who are “unhappy” with the party leadership’s direction in terms of the abortion issue. “We have nine elected representatives declared for us, which puts us at about the same as the [Social Democrats] were on the go three years ago... we’ll probably be passing out the Green Party fairly shortly,” he said, adding that he is in talks with a further 30 elected representatives. Local elections take place on both sides of the border in May, and Mr Toibin hopes to have 20 elected councillors running and to build momentum for challenging for seats in the Dail and Stormont. “There are a lot of people in the wrong political party at the moment. There is a realignment happening in politics. A lot of people through bonds and friendship and through tradition and history, which are important of course, feel they are tied into their own political organisations currently,” he said.